New York Times and USA Today bestselling author Cora Carmack follows up her trio of hits—Losing It, Faking It, and Finding It—with this thrilling first novel in an explosive series bursting with the Texas flavor, edge, and steamy romance of Friday Night Lights. When your dad is a coaching legend in Texas high school football, your life isn’t your own. That’s why Dallas Cole can’t wait to get to Rusk University and finally get out of her father’s shadow. But when he makes the jump to college ball—at her school no less—it’s déjà vu all over again. Now, half the team (and all their groupies) avoid her like the plague, convinced she’ll tattle to her notoriously hardass father about a frat party or a bent curfew. The other half just wants to use her to get closer to the coach. And then there’s Carson McClain, the supremely hot, newly transferred second-string quarterback. Oblivious of her identity, he approaches her at a party, and for once in her life Dallas decides to kiss first and ask questions later. While the heat between them is undeniable, Dallas and Carson have more than a few issues to tackle. He’s a football player with a lot to prove. She’s the coach’s daughter who just wants a life of her own. How can they possibly win when they’ve both got so much to lose? To say that I loved this book is a complete understatement. From the beginning I was laughing out loud and fell in love with Dallas and Carson from the get go. I absolutely loved how awkward Dallas is. Her actions and words had me laughing from chapter one. She is seriously a breathe of fresh air when it comes to leading ladies. I want to be her friend. Carson is, well, smooth. I loved their first meeting. I wanted to read it over and over again. It was so real, and awkward, and lovely. I love how Friday Night Lights(ish) this book is. I love that show and this book just reminded me of it. Not that it's like the show, but just how it's centered around football, and Dallas is the coach's daughter. Dallas' relationship with her dad. Okay, I wouldn't say I loved it, but come on, it's just been Dallas and her dad, so things are bound to get a bit awkward between the two of them. But I loved how they handle it and how her dad comes around to be the dad he should be with Dallas. Um, nothing. I seriously plan to read this book over and over. I absolutely loved it. I want more Carson and Dallas. Please? Cora Carmack is one of my favorite New Adult authors! I always look forward to her books because she has a way of writing characters who are not only flawed, but hilariously funny and easily relateable. All Lined Up is no different. In fact, out of all of her stories, I think this book is her best work yet! Dallas Cole is guarded to say the least. Having spent years living with her dad, a hard-nosed football coach who only speaks "playbook", she learned a long time ago to keep her emotions in check. The only time she does allow herself to feel is when she's dancing. But this is college and Dallas shouldn't be spending all of her time studying or stuck in the dance studio! She should be enjoying herself, meeting hot guys new people and kissing them having fun! Like her best friend with no filter Stella is. It's Stella who drags Dallas to the first party of the year, the one where she has an unpleasant run-in with her ex-boyfriend, and meets bad-boy Silas. But it's also where she meets the one person who will turn her life upside down in the best way possible. 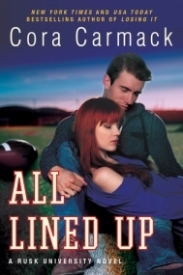 Tall, dark and driven, Carson has come to Rusk University for one thing and one thing only, football. He's determined to prove himself to the new coach and his teammates, whether it's logging extra hours in the gym, on the field or in the classroom. He can't allow anyone or anything to distract him either because there is no back up plan. When he meets Dallas though, he decides that maybe a little distraction isn't so bad. But then he finds out who she really is and it's a total game changer. For both of them. All Lined Up is not without it's deliciously swoony moments and it packs plenty of steam. However, I appreciated the amount self-control Dallas and Carson showed and their reasons for doing so. It was refreshing and made those scenes all the more face fanning in my opinion. I thought Cora Carmack did a beautiful job of portraying the relationship between Dallas and her father too. It's complex and difficult but steeped in love and one I could easily relate to. All Lined Up is an excellent start to the Rusk University series and I'm really looking forward to the next installment! Christian Louboutin ?????? | Christian Louboutin ?????? | Christian Louboutin ????? ?